Of the many challenges facing designers of wireless communications systems, interference stands out for its ability to confound the best efforts of designers to rid themselves of it. RF interference arguably became a problem at the very beginning of radio in the late 19th Century, and has increased in parallel with advances in technology, the use of higher and higher frequencies, and the density in which RF systems of every kind have been deployed. Throughout this time, RF and microwave filters have remained the “go-to” solution for mitigating interference in new designs and systems already deployed. They’ll be even more valuable in the coming years as the spectrum becomes more crowded, more rapidly, than ever before. To understand just how severe interference problems have become, some of the systems-level approaches to mitigating it, and where filters fit in, it helps to look at some examples. The problem of interference has become severe for various reasons, but the most obvious is simply the enormous number of wireless devices in any given area at a time (Figure 1). For example, a single smartphone has its primary transceiver as well as those for Bluetooth and Wi-Fi along with a GPS receiver. In an airport, for example, it’s common for there to be hundreds of smartphones in operation within a small area, and tens of thousands in a stadium. Figure 1 • The FCC’s depiction of the spectrum tells the story: too many emitters; too little space. In the latter case where 40,000 people may present, this number multiplied by three separate transceivers and a receiver, means that there are 160,000 RF devices in operation. This doesn’t include the stadium’s distributed antenna system, cellular small cells, the communication system used by the stadium’s management and employees, public safety land mobile radios, dozens of microwave ovens at food stands, and assorted other devices. This situation will become more intense as frequencies are allocated for new services such as the Citizens Broadband Radio Service (CRBS), more 5 GHz allocations for Wi-Fi, the Dedicated Short-Range Communications (DSRC) band at 5.8 GHz for intelligent transportation systems, and the fifth generation of cellular that will use frequencies above about 3 GHz for the first time. In many cases, these services will operate on a shared basis with incumbents, a challenge for which current approaches haven’t been particularly successful in the few cases where they have been attempted. However, most challenging of all will be how to accommodate the immense number of devices that will be used within the wide umbrella of IoT that communicate in two ways: to the Internet via Low-Power Wide Area Networks (LPWANs) and the small cells of wireless carriers, and the wireless-enabled sensors that collect the data and communicate over short distances using Wi-Fi, Bluetooth, and ZigBee and another 802.15.4-based variants. In both scenarios, keeping these devices from interfering with one another is obviously essential but very difficult (Figure 2). 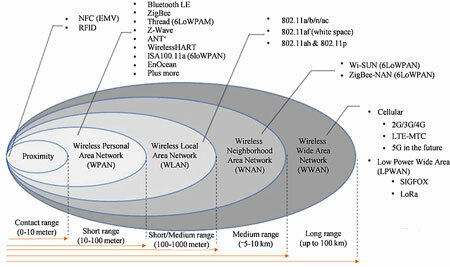 Figure 2 • IoT is but one of the applications that will dramatically impact the spectrum, as wireless connectivity is essential from the device itself (at left) to the Internet. The short-range standards all offer some type of interference protection, typically a “listen-before-talk” approach, in which a device “sniffs” its nearby electromagnetic environment and sensing a potential conflict moves to another channel. While this works admirably, it’s not perfect (nor could it be expected to be), and congestion is now so extensive in many areas that interference is effectively rendering Wi-Fi at 2.4 GHz unusable. The 802.11ac and coming 802.11ax standards operate only in the far-less-crowded 5-GHz band. This helps alleviate congestion at 2.4 GHz but as some of the 5 GHz spectrum is shared with other services such as military radars, another potential issue emerges. It also doesn’t address the problem of harmonics and spurious emissions that even though at a very low level can cause problems. A good example of where filters could have been a potential solution but were overlooked is the public safety sector. Beginning in 2004, the FCC began its 800 MHz “rebanding” initiative to ensure that public safety communications would be protected from nearby cellular services. It would achieve this by moving operating frequencies of narrowband and broadband services away from each other. The issue at the time was related to interference to public safety land mobile radios from Nextel Communications’ iDEN systems. Nextel (and later Sprint, which acquired the company) ultimately agreed to make the move, which was neither trivial nor inexpensive. The whole process was supposed to be completed by the end of 2008 but took nearly a decade longer. Nevertheless, rebanding is almost complete but it apparently hasn’t solved the problem, as interference continues to be reported. Notably, a filter-based solution was proposed early in the process by Jay Jacobsmeyer, owner of Pericle Communications, who suggested using filters to keep out-of-band emissions in check. He even described a ceramic filter placed between the radio and antenna that could make a significant improvement. Oddly enough, this simple, inexpensive solution was not widely adopted. Military radar and communications systems face some of the greatest interference challenges. In addition to the aforementioned commercial services, defense systems also face intentional jamming from adversaries and even their own systems. It might be logical to assume that military systems would get special treatment in terms of interference-free frequency allocations, but DoD has long needed to fend off attempts to poach its allocated spectrum. However, as frequencies available for commercial use are dwindling, some of DoD’s often-unused spectrum has come under attack. While it’s not likely to be reallocated, it is already being shared, a solution neither DoD or commercial services like, at it is extraordinarily difficult to achieve. Navy destroyers are interference generators of longstanding. A typical destroyer has dozens of antennas operating at different frequencies, many times within a few inches of each other, and often radiating signals at very high RF output levels (Figure 3). Communications, various types of radar, and electronic warfare systems create a “forest of antennas” that all cohabitate this relatively small platform, making interference inevitable. Figure 3 • A typical Navy ship is dozens of antennas serving application from communications to radar and EW at frequencies from HF through millimeter wavelengths. It’s not uncommon for one system to be turned off (manually) so another system needing an immediate and interference-free environment can function, obviously an undesirable situation. Adding a new system becomes a massive undertaking as it must be made to work within an already dense electromagnetic environment. Without use of band pass, lowpass, high pass, and band stop filters, this would be difficult if not impossible. 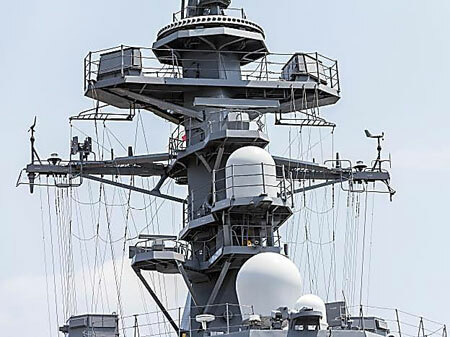 The Navy’s Integrated Topside (InTop) initiative, begun in 2010 within the Surface Electronic Warfare Improvement Program (SEWIP), is tackling this head on by reducing the number of antennas required and prioritizing their operation in real time. It is an extension of a previous effort whose goal was to use multi-beam, multi-function aperture to simultaneously support EW, communications, and radar with just two electrically-scanned arrays. Having achieved considerable success in this effort, the Navy initiated the Electromagnetic Command and Control (EMC2) program to demonstrate a system that integrates all the RF functionality of EW, radar, and communications into a common set of open-systems antennas, electronics, and software. It will endeavor to monitor a broad swath of spectrum and reallocate functions to the best frequency based on changes at every moment. The success of both programs does not eliminate the need for RF and microwave filters, as they approach the problem fundamentally rather than at the system level. When compared to the elaborate approaches to keep devices from interfering with each other, filters are simplistic and inexpensive, which makes them essential even if more elaborate schemes are used. However, it’s important to differentiate the two because they actually solve different problems. Elaborate, broad-based approaches provide device management over a wide area by monitoring and alerting potential offenders, which much cease operation or move elsewhere. There are two ways to accomplish this. The first forces a device to access a database to determine if the channels it intends to operate on are available at its location, and the second requires that the device be able to sense its spectral environment and move if necessary. The latter, database approach has been chosen for the TV white space allocations as well as CBRS because of the problems inherent in spectrum sensing. However, both focus on solving the problem not within or attached to a device but through a nationwide approach using software, a comprehensive database, and the ability to make a decision and force a potential interferer to change channels. In contrast, RF and microwave filters solve interference problems at the hardware level, reducing or eliminating interference at its source, making it an inherently “local” solution. That is, they solve a specific interference problem rather than lurking over an entire, potentially nationwide system and acting on impending problems. Both filters and broad-based approaches are essential. 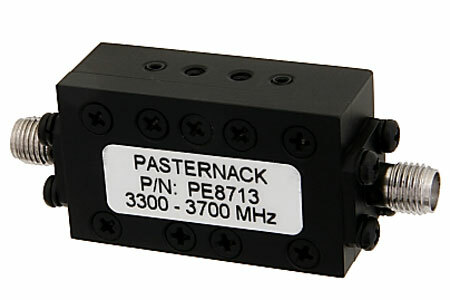 Pasternack’s PE8713 is a good example of a combline band pass filter for 3 GHz application that has 1 400-MHz passband between 3.3 and 3.7 GHz, low insertion loss, and rejection of 50 dB (Figure 4). Figure 4 • Pasternack’s PE8713 combline bandpass filter has a 400-MHz passband from 3.3 to 3.7 GHz that is well suited for CBRS and other applications in the 3 GHz band. It has 50 dB of attenuation outside the passband, handles 5 W, and has insertion loss of 0.75 dB. While design engineers try hard to reduce the number of circuit components while either retaining or increasing performance, that hasn’t proven possible with filters. Eliminating SAW filters in smartphones, for example, would free-up space and reduce complexity and the bill of materials, but with increases in the number of bands these tiny products must serve, they have an even greater need for filters than ever before. Base stations, from macro to femto, present challenges as well and but at higher or much higher power levels, which is why there are and will continue to be cavity bandpass filters in each one. This environment is made even more complex when multiple wireless carriers have their equipment in the shelter and antennas and radios on the tower. The result is a jungle of cables and various passive components ranging from power dividers and combiners to switches, and the likelihood of interference problems that only filters can solve. Even though antennas can cover multiple bands, the transmitter outputs for different bands must be combined to feed them. The answer to this is multiplexing (i.e., filters) in the form of duplexers that combine two bands, triplexers that handle three bands, quadruplexers up to four bands, and so on. There is no more cost-effective, space-efficient way to multiplex transmit and receive paths into a single antenna (or vice versa), or split signals from a single antenna into multiple base station receivers, allowing the system to accommodate a greater number of operating bands. This also applies to small cells, which because they produce lower RF output powers, can use smaller multiplexing devices. Bandpass filters are by far the most common type because they solve issues almost every designer or field technician faces, but band stop (band-reject) filters can be exceptionally useful in certain applications. Band stop filters have the opposite job of bandpass filters, as they pass all frequencies but those in a very narrow range, severely attenuating interfering signals. The steeper the filter’s attenuation curve and the narrower its passband the higher its Q factor will be. It doesn’t take much imagination to see how valuable notch filters have become in today’s incredibly dense signal environment. When the interfering signal is very strong, no band stop filter can reject all of it, but even then, these filters can reduce it to a level that won’t degrade a system’s performance. Similarly, lowpass and high pass filters that as their names suggest pass all frequencies below or above a cutoff frequency, can attenuate the fundamental frequencies of nearby emitters as well as harmonic and spurious signals from distant ones. Interference has been a problem since Heinrich Hertz built his first radio, which could interfere with the first. It has increased to epic proportions, and will only get worse, which means that every viable solution for disposing of it must be used, and of all the candidates, filters have the longest record of accomplishment, are the least expensive, and can be employed virtually anywhere a problem arises. Consequently, while the wireless industry looks at the problem from on high, filters will continue to make the difference down at the hardware level to solve problems no other approaches can handle. Mark Blackwood serves as Product Manager at Pasternack Enterprises.